AIR-SHIELD 25 MIL FLASHING TAPE is a self-adhering, flexible membrane flashing. It is a roll-type product that is nominally 25 mils thick. This material is an air, vapor, and liquid moisture barrier. When properly applied, the product reduces the risk of rot and mold development. AIR-SHIELD 25 MIL FLASHING TAPE provides protection against water infiltration in critical detail areas, such as window and door openings, deck-to-wall intersections, corner boards, wall-to-wall tie-ins, foundation sill plates, sheathing panel seams, under stucco finishes, masonry walls, and other non-roof detail areas. AIR-SHIELD 25 MIL FLASHING TAPE should be stored palletized and protected from rain and/or physical damage. Do not store at temperatures above 90º F (32.2º C) for extended periods of time. Do not leave membrane exposed to direct sunlight. Do not double-deck pallets. Store away from sparks or flames. Outdoors, store AIR-SHIELD 25 MIL FLASHING TAPE on pallets and completely cover. 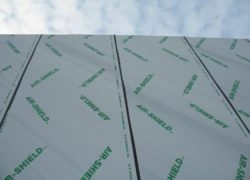 Apply AIR-SHIELD 25 MIL FLASHING TAPE in fair weather conditions when the air, surface, and membrane are at temperatures of 25° F (-4° C) or higher. After precipitation, allow a minimum of 24 hours for drying before installation. Install directly onto a clean and dry surface. Remove dust, dirt, and loose nails. Protrusions must be removed. Surfaces should have no voids or damaged/unsupported areas. Repair surfaces before installing. Surfaces should be free of scale, rust, grease, and oil and conditioned with MEL-PRIME™ or MEL-PRIME W/B from W. R. MEADOWS. Application Method … Cut AIR-SHIELD 25 MIL FLASHING TAPE to desired length. Peel back the release paper to expose adhesive. Align the membrane and press into place with heavy hand pressure. Laps must be a minimum of 2.5″ (63.5 mm). Consistent with good construction practice, install the membrane so that all laps shed water (following the shingle principle). The top membrane layer should go over the bottom layer. Always work from low point to high point. Service temperature is -40° to 158° F (-40° to 70° C). Do not leave product permanently exposed to sunlight. Maximum recommended exposure time is 30 days. The rubberized asphaltic membrane component (soft black side) may not be compatible with most polyurethanes or silicones. W. R. MEADOWS offers a line of approved products as part of its complete system. Please reference the appropriate detail for the specific application. When used with other products than recommended, ensure compatibility through either testing or written approval from the manufacturer.